There’s many ways to tell when something is really popular, and HBO’s Game of Thrones has achieved plenty of them. But one of the very best ways to gauge popularity is when fans are so dedicated they’re willing and wanting to put in the time and effort required to learn how to speak a fake language that was created for a TV show or movie and so on. This too is something Game of Thrones has achieved when it comes to the Dothraki language, a language that was created specifically for the show. Various online communities have been created to catalog Dothraki dialogue, vocabulary, and grammar from show scripts, and some people teach what they know of the language in YouTube videos. 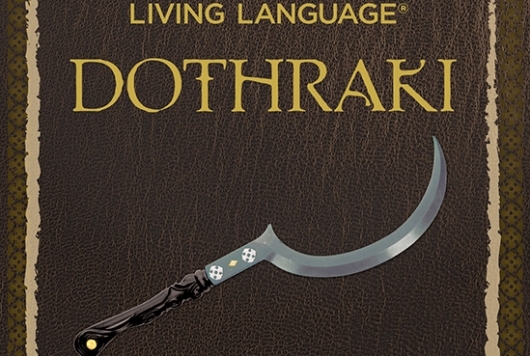 But come this fall, those who truly want to learn how to speak Dothraki will have the opportunity to through the release of Living Language Dothraki: A Conversational Language Course Based on the Hit Original HBO Series Game of Thrones. If interested in learning Dothraki, you can head to HBO Shop and/or Living Language for more information and to pre-order.